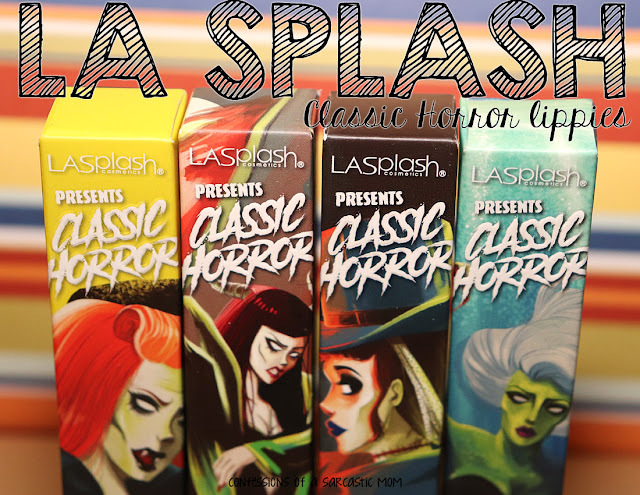 Last chance to enter to win your very own bottle of China Glaze Ghoulish Glow. Ends in a few hours! I have a combo for you today - and I wish I could say I enjoyed it haha Well, I absolutely LOVE the way it looks, but it wasn't very nice to apply. 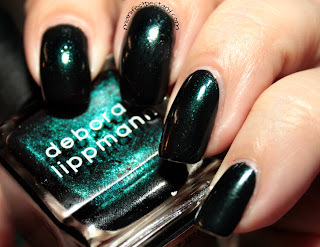 This here is Deborah Lippmann Don't Tell Mama topped with ORLY Mermaid Tale. It looks stunning visually, but Mermaid Tale was so thick and so goopy. I'm not sure if you can tell, but mostly on my pointer finger...it looks misshapen! Like my nail is all wonky. I couldn't even keep this mani on for 2 hours. I had to take it off. Here's what it looked like before the glitter goop! Such a lovely shimmer! 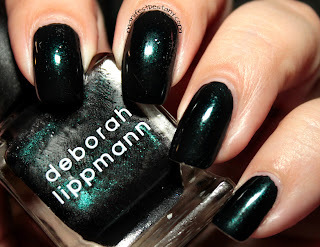 This is one of those polishes that is so dark it looks black in a lot of lights. What do you guys think? Do you have ORLY Mermaid Tale? Was/is it goopy for you? I know thinner could take care of something like that, but I wasn't expecting it to be so goopy... especially because I've used it before!